VSmile learning system teaches children preschool basics through interactive TV gaming. The VTech system uses the fun of interactive TV gaming to help kids explore language, math, phonics, problem solving, and reading comprehension. 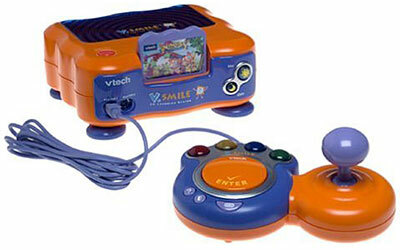 V-Smile includes the console, a joystick, and one learning game cartridge. The innovative joystick is adjustable for both right and left handed users. It features four flashing buttons and one large enter button specially designed for preschoolers.